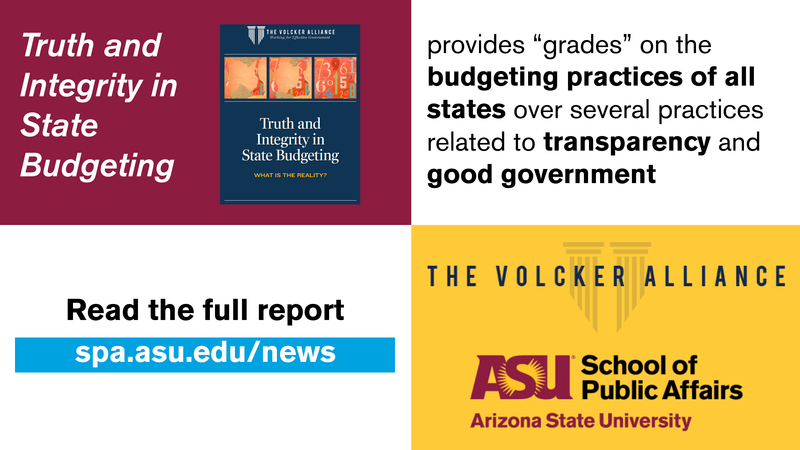 The Volcker Alliance unveiled their new report: "Truth and Integrity in State Budgeting" at a press conference on November 2. Dan Hunting of ASU's Morrison Institute for Public Policy and David Swindell, ASU's Center for Urban Innovation director and School of Public Affairs associate professor, worked on the project and involved students in the Master of Public Administration capstone courses to help collect the data for the evaluation of budget practices in Arizona, New Mexico, Colorado, and Nevada. The report provides "grades" on the budgeting practices of the 50 states over a wide array of practices related to transparency and good government.